Place the chopped eggplant in a large colander set over a bowl or in the sink and sprinkle with 1 teaspoon of the salt and stir well. Drain for 30 minutes. Rinse the eggplant under cold water and pat dry with paper towels. 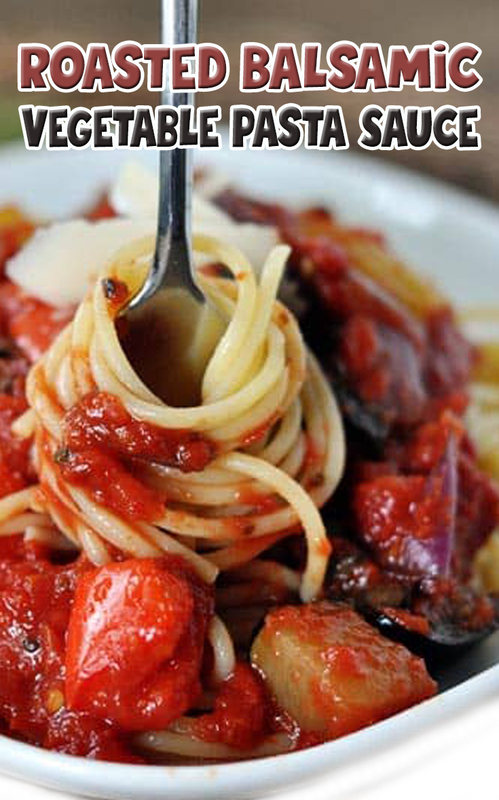 Preheat the oven to 425 degrees F. Combine the eggplant, zucchini, bell peppers, mushrooms and onion in a large bowl. In a small bowl or liquid measure, whisk together the oil, vinegar, garlic and rosemary until well blended; pour over the vegetables and toss until evenly coated. Scoop the vegetables onto a large, rimmed baking sheet (12X18-inches) spreading out evenly (use two pans if it seems only one pan is overly full). Bake the vegetables for 25-35 minutes until the vegetables are golden and tender, stirring occasionally. Sprinkle remaining the remaining 1/2 teaspoon salt over the cooked vegetables (more to taste if needed). While the vegetables roast, combine the crushed tomatoes, water, sugar, basil and pepper flakes in a large saucepan. Bring to a boil over medium-high heat then reduce the heat to medium-low and simmer for 10-20 minutes, stirring occasionally. Add roasted vegetables to the tomato mixture. Simmer for 5 minutes or so, stirring occasionally. Serve over hot cooked pasta with freshly grated Parmesan cheese.